Michael writes asking for help creating a three-letter logo from the initials DRD, which have no natural points of connection — unlike, for example, those of CNN and General Electric . . .
Our article, How to design a logo of letters, illustrates many techniques for linking stubborn letter combinations. DRD, however, cannot be linked without distorting or appending the characters unnaturally, the results of which almost always look contrived. If your project can stand a little adventure, try this. “Connect” your initials by using a radically styled typeface in which the letters have been designed to look alike. Here are three . . .
Then, create a motif based on the character of the typeface. For example, Van Doesburg consists entirely of straight horizontal and vertical strokes, with neither curves nor, more radically, angles. Each letter looks like a block. Take advantage of this by arranging the letters in a block bisected (in this case) by horizontal and vertical hairlines, and soften with color . . . Finish by adding the company name; below, it’s in curvy Cantoria. Many other typefaces would work here, too, because the DRD is so different that it automatically creates contrast. Generally speaking, for readability avoid using the logotype font for the company name. This technique has limits, obviously. The thing to remember is that wild styles can often be civilized by presenting them in conservative, low-key settings. Try it! Van Doesburg and Planet Kosmos are free typefaces. Mojo is an inexpensive Adobe font. 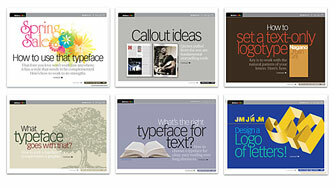 For more reading on letter-based design, check out Before & After’s PDF Type bundle #1. This entry was posted in Design, Logo design, Type. Bookmark the permalink. ← Designing under the influence . . .
Nice treatment. One modification I would have suggested would be to stylize the”R”, as it appears awkward due to its skewed downstroke. A slight adjustment in Illustrator could move it flush to the right to complete the “boxiness” of the font and the overall layout. Of course, on closer examination, that modification would convert the “R” into an “A”, so back to the drawing board! Here are some other considerations that quickly struck me. The first using Planet Kosmos, I have overlaid the “r” on top of the second “d.” This works well with this font, since the letter characteristics are so similar. The second logo that I quickly put together uses only simple, rounded strokes of varying lengths set at a 25-degree slant. I actually like the second one, depending on what the company is trying to communicate, of course. Thanks for the compliments! I really like the rounded strokes version as well. Super simple, but could be very effective. Eli, nice image, but beware of being derivative. Check out the Manpower logo. I see what you’re saying. 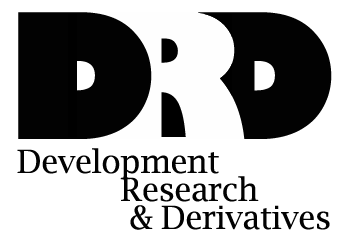 I think simple revisions like these two would set DRD apart from the Manpower logo. Love the first one. The second one needs a closer look to see what the letters are. I asked a friend what those letters stood for, and she said she had no idea until I told her, then she could make it out. Combining reversed letters to create negative space works too. Van Doesburg may provide the inspiration for the logo, but I believe that once you look at the letters you want to use, Van Doesburg needs help in the “R” department. For a more cohesive design, I suggest making your own “R” based upon the Van Doesburg principles (quite simple) that appear more in line with the two D letters. I also wasn’t wild about curvy Cantoria. It appears a little thin, especially if the logo will be reduced (as on business cards). I’d go for something with a bit more weight. I liked the look of Copperplate Gothic. I also slightly bolded up the crossed lines and changed the “and” to an ampersand (which obviously would not be acceptable if it was not in the client’s actual name). Copperplate certainly works. Your R serifs, however, add many small parts, corners, and zigzags, which slow the movement and, paradoxically, are actually less like the Ds, which couldn’t be simpler. (Compare the negative spaces.) Better, I think, to live with the tension of the off-balance R.
As for Cantoria being “thin,” think of the DRD logo and the written-out name as separate things. At small sizes the DRD — which is bold and easy to see — would get small, while the written-out name would remain larger. It’s a good rule of thumb for any logo, not just this one. Thanks so much for all the inspiration. Coincidentally, I have been laboring over a project with the letters WTD. I am still not clear how I want to do this, but at least you have provided me with some ideas. Free for personal use, right? You wouldn’t want to use them in a logo design for a client. Mary, I’m not aware of any restrictions. It says “free for personal use” right above the download button (on the Planet Kosmos font). Using free fonts with this “license” for a commercial logo design can lead to problems for you or your client down the road. I’d make a good umpire — totally didn’t see that! Thanks for the catch. For commercial permission, check with the font’s originator. Very likely that you’ll be able to use it. I am an aspiring professional graphic/web designer. Since 2007, I have been practicing on the range of Adobe software. Today I am at a point where I am very comfortable with the tools of the trade. However, where I am really struggling is with my creativity. I am usually in awe when I see a design evolve as in this logo example. That is the creativity that I so desperately need to develop. I have bought all of John McWade’s books and have learnt a lot of techniques. I admire John’s creative instincts. It’s truly a delight and pleasure to look at his work. Thanks John for sharing your knowledge. Normally I’m a huge fan of your designs. This time, I have to say I hate it. It reminds me of poorly done Microsoft clipart. Why wouldn’t something like this have worked (with a bit more polish)? Trisha, the short answer is that it could; it’s just an entirely different look and feel. You’ll see the identical technique in our How to design a logo of letters article. Of all the logos I have seen on this, so far I like Eli Shirk’s. So fun doing this with you guys!